The March 2 report, presented pursuant to the California Whistleblower Protection Act, outlines 10 “substantiated allegations” involving state agencies and colleges. The auditor detailed examples of inappropriate expenditures, including misuse of state time and resources, inaccurate attendance records and improper payments. In one recorded instance, State Auditor Elaine M. Howle describes a California Department of Corrections and Rehabilitation parole agent who misused a state vehicle for her personal commute for a total cost of $3,800 to the state. That agent also improperly stored the vehicle at home, according to the report. “Through our investigations, we found misuse of state time and resources, failure to keep accurate time and attendance records, disclosure of confidential information, neglect of duty to supervise, and improper payments,” Howle wrote in a letter attached to the report. The whistleblower act gives the California state auditor the authority to investigate improper governmental activities, including illegal and economically wasteful actions taken by state agencies and employees. The March 2 report outlines investigations completed between July 2016 and December 2016. A representative for the California State Treasurer’s Office didn’t immediately return requests for comment. 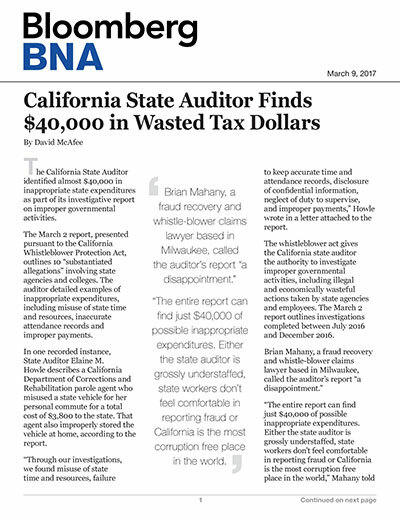 The report also describes a California Department of Transportation (Caltrans) analyst who misused state time by “taking excessive breaks and extended lunches during her workdays.” The auditor’s office estimates that the analyst misused an average of 130 hours of state time between July 2015 and March 2016, costing taxpayers approximately $4,300. Also in the report is a library employee at California State University, Fresno, who misused the school’s resources during a 13-month period. He allegedly visited more than 48,000 online game and video webpages unrelated to his work, costing the university as much as $22,200.